The holiday season brings out a part of me that surfaces only once a year. The creative side! I find this hysterical because… I don’t have a creative bone in my body! I don’t knit or paint or cook or anything even close to that! But for some reason, I LOVE to wrap gifts. I have no idea why, but I actually look forward to it. Several years ago, I took a gift wrapping class at one of those adult education sessions. I learned all about wired ribbons, how to twist and turn them into the perfect bow, and especially how to add the finishing touches by putting a bell or Santa or something holidayish in the middle of the package, making it all come together. 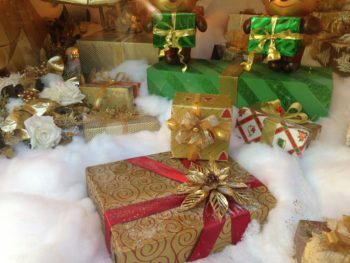 In a recent trip to downtown Chicago, I even found myself taking photos of Macy’s window display so I could get new and improved ideas for wrapping this year’s gifts. At home, during my gift wrapping sessions, I emerge covered with glitter from head to toe – it’s everywhere – and I love it. Do you have a holiday obsession? Something that brings you great joy, and something that happens only this time of year? Decorating cookies? Putting lights up outside in the freezing cold? Or something totally out-of-the-box. I’d love to hear it. Please share with us your own uniqueness and individuality that brings a smile to your face during the holidays.